When I was younger I suffered with fairly bad acne. I was on Lymecycline tablets and then on the Dianette contraceptive pill for many years to keep it at bay which is now banned because of its side effects. I am still on the pill but a different one called Yasmin. I am paranoid that if I came off it my skin would return to being crap because it goes ridiculously oily when I'm off it. I now take my skin care regime seriously and know the importance of looking after your skin. I have know people who have gorgeous skin who would sleep in their makeup and I could never dream of doing that at this age as it is SO ageing. Even after a night out I will always remove my makeup, brush my teeth and my hair! Getting on to my daily routine. Step 1: Use a large cotton pad with a few squirts of Boots No7 Skin Micellar Cleansing water (£5.00 currently, normally £8.50) for normal/oiler skin. Remove the majority of your face makeup. 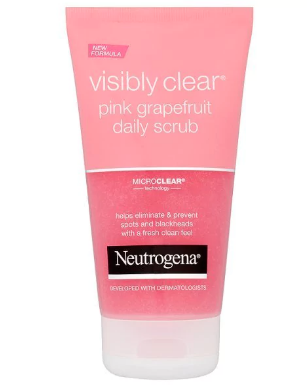 Step 2 Use warm water to wet the skin then gently exfoliate with Neautrogena Visibly Pink Grapefruit Daily scrub (£4.40) in circular motions then rinse and dry. Step 3 Remove any black from around your eyes and any mascara with a face wipe or baby wipe - I use baby wipes as they are just as effective. Step 4 Apply a splash more cleanser on a fresh cotton pad to remove the final makeup & dirt from your skin (you will be surprised what's left). This cleanser from boots is a godsend. I once read that you literally do not need toner as it does nothing for you, but cleanser is another story. After using it I now can't believe people who only remove their makeup with a wipe! I can assure you all your make up wont be removed even if you can't see any make up remaining... and this could cause spots. After I have washed my face in the evening after wearing makeup I won't apply moisturiser. 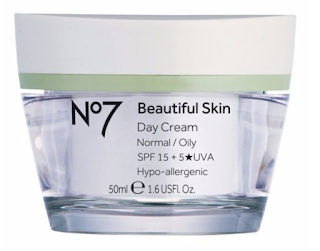 Some people's skin may be too dry for this but after changing my routine to just applying moisturiser in the morning it made my skin feel so much healthier. 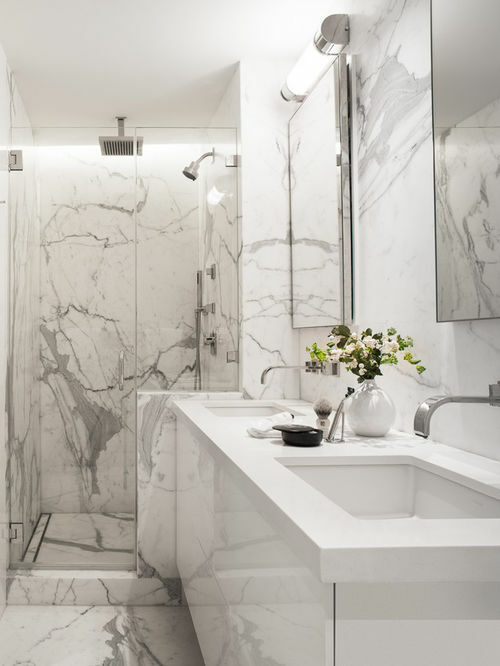 I was once on my way to Mallorca and at the airport I was stopped by a skin specialist who advised me of this and I didn't believe him until I started doing it myself, but my skin does feel strangely better for it. 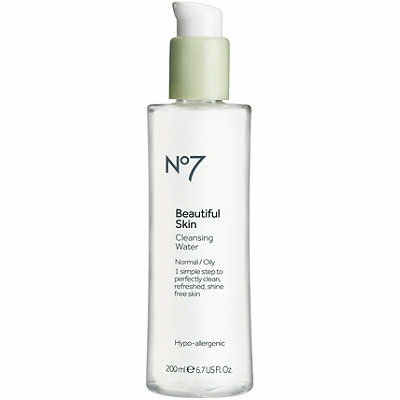 If you have normal to oily skin this may only benefit you as I know that everyone's skin is different! Anyway I use Boots No7 Beautiful Skin Day Cream for normal/oily skin (£14.00) moisturiser just once in the morning, it's nothing fancy but does a good job. Since turning 25 I was advised by my mum who has the most amazing youthful skin, to start anti wrinkle cream just around my eyes to prevent wrinkles. Luckily I stopped heavy nights out when I was 21 so I've managed to avoid any noticeable eye wrinkles so far! 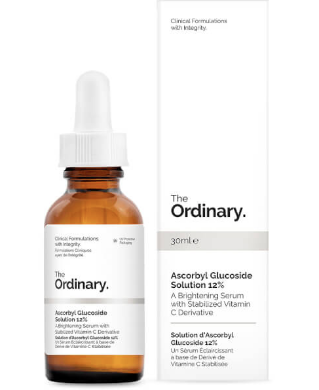 I purchased Clinique Smart Custom eye treatment (£40.00) eye cream which is about £40 but I know they are a trusted brand so I am rolling with it! I apply this after moisturer in the morning and after removing my makeup before bed. Now this daily routine works perfectly for me, and I'm sure it may for others so even if a couple of the tips are useful I'm glad I shared. As an added extra I have started using The Ordinary Abscorbyl Glucoside Solution 12% (£8.90) serum that I got for Christmas, it's a hydrating treatment formula which is meant to visibly brighten skin tone, reduce signs of ageing such as lines and wrinkles and be comfortable to use. I'm normally a bit cautious about adding any other products into my routine as mine works well and I wouldn't want to disrupt the peace but I thought I would give it a go and it hasn't had any negative impacts so I would say so far so good! 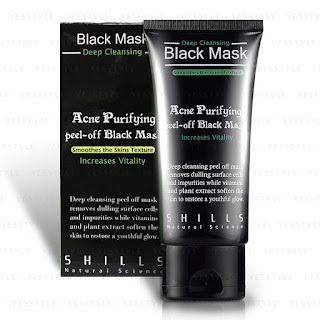 Maybe once every two months I use Shills Acne purifying peel-off black mask (£6.52). Its a black mask that you apply with your fingers, leave on for 20 minutes and then peel off and oh my lord it kills. It pulls off everything even the tiny hairs on your face. It cleanses deeply removing and dulling surface skin cells and impurities in pores with its charcoal content, while vitamins and plant extracts soften skin and smoothen texture which gives you a glow. When I have done one the night before people have noticed and said my skin was glowing. It is really painful and a bit of a pain in the arse to peel off but SO worth it. I occasionally use a dermaroller on my skin in an attempt to clear some slight acne scarring that is probably only really noticeable to me but it still bugs me. It definitely works but only very gradually and you have to be VERY careful when using as it could damage your skin if used incorrectly. If you want to know more about using one then I would google/research into it. I hope this has been helpful and not one product has been gifted to me - I bought and came across all of these myself and have been using for a few years now. All the products are linked. Any questions feel free to contact me always. These products are important for the healthy skin. If you are getting wrinkle then, get the anti wrinkle injections london will help you in treating your skin.